Apple revolutionized commerce with the release of Apple Pay. While other tech and telecom giants like Google, AT&T and Verizon have tried to transform the wallet, commerce experts predict that Apple will be the trendsetter for mainstream digital wallets. Apple Pay has reportedly double charged some customers, but the timing of the release and the security-centered technology creates a unique advantage for the digital wallet. Are you a fan of Apple Pay? PwC's The Wearable Future report found that 53 percent of the millennial generation are excited about the future of wearable technology. The report identified major opportunities for the media and entertainment industry, despite health and fitness leading the wearables trend. With opportunities across all verticals, it's predicted that wearables sales will topple 130 million unites by 2018. 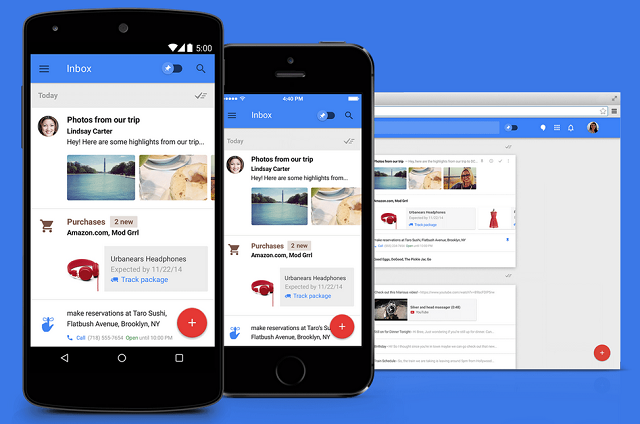 Google released a revamped Inbox app to combat the overflowing inbox. Inbox will bundle conversations into precises categories and pull out the most important bits of information from emails. These features will restore sanity and clean up the cluttered inbox. This new app will be helpful for consumers, but also pose a new challenge for marketers trying to get their messages noticed. Essentially, marketers should send more personalized messages if they want to stand out in Google's new Inbox. Facebook recently announced a new app called Rooms that will revive internet forums on mobile devices. The semi-anonymous app allows users to participate in conversations based around their interests. Rooms isn't connected to Facebook or mobile contact lists, so you must create a unique username to sign up. The anonymity and freedom of Rooms may appeal to users hoping to participate in conversations outside of their comfort zones. I'll be interested to see if the new app takes off. Formspring's demise was due to cyberbullying, but Spring.me is working to re-brand the social networking site as the friendliest of all. Spring.me is encouraging users to make friends through asking and answering questions, which differs from similar social networks like Ask.fm, Whisper and Secret. The median age for Spring.me is 21 to 24, and the creators say this will also avoid cyberbullying (most bullying happens from the ages of 12-16). The social network is hoping to attract more users through new features and mobile apps. I'm going to keep tabs on the new platform because like many social networks, great ideas can quickly fail.